Sometimes we can lose sight of what's most important to us, but it's good to take some time off every now and then to remember why we work and fight so hard. 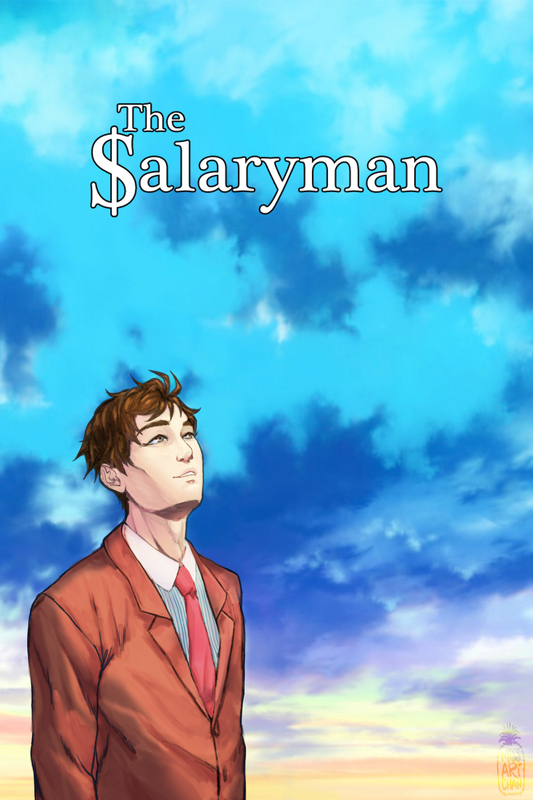 The Salaryman is a visual novel submission to SuNoFes17 about a working-class man who's having some trouble keeping up with his job. Take the day off and meet some new people, or work out your problems at your desk. Whatever your choice, find some peace and solace in those around you. I can't express how much I absolutely ADORE this game; from the moment I opened to the very end of the game, I was taken for a RIDE I tell you. The music couldn't have been more engrossing, the characters and the story are all so straightforward and ordinary in their motives and actions yet so compelling in its own simplicity that I can't help but grow attached to a short minute introduction of each characters that I approach and interact with. Game developer/s I commend and praise you for the amazing end result of your efforts; I want and wish nothing more than to see the progression of development and the final full (hopefully free) release of this visual novel game. Yayyy~ I'm so glad you love this game! I don't update much about it, but currently, I'm drawing a custom set of sprites to enhance the experience. Hopefully my art style will suit the overall vibe. The essence of the game is to appreciate the little things in life, so I'm super happy that you're able to enjoy each character and tidbit of the story. When I do release it, it will be totally freeeee~! Thanks so much for your comment! Holy Crap..! It's gonna be free?! Nicee but honestly I would have preferred to help out in any way for independent indie game developers or just regular ones like yourself, but sad to say I don't make my own money yet so I very much would like to apologize and say thank you nonetheless. Okay I feel like that last statement is a bit concerning. Hopefully you're still doing alright; making by and making it work in life and such, at least you're talent isn't wasted. Oh! Haha, there's no need to worry! I don't have a real job because I'm a full-time student and I'd like to dedicate most of my time to studying, which is why I say I can't support myself yet lol. But thank you for your kind thoughts! I'm doing my best to continue doing things I love~! So far, it's working out well. Hi- here to give some feedback! -I really loved the tone of the story, the beautiful sky, the bright, crisp colors. And the music was wonderful! - I loved playing as a young professional man, I feel like men are way underrepresented in VNs, especially adult men. -Almost all of the characters were drawn very well, the main character was excellent, so were all of the young characters we met. - I also loved that it was slice of life. And I do agree that it would be better as a shorter story than a longer one. It would be nice if there would be a lot of short branches and many different possibilities in the one/two days instead of only a few long branches. -I loved that there was a lot of choices and short concise dialogue. -In the work route, there's a chunk of time where there is complete silence and no music is playing. -The coworker isn't drawn very well and is not the same style as the other characters. -When you visit the pastry shop, the dialogue between the male employee and the male main character is really really weird. It's like they are hitting on each other. It's not very pleasant. Overall, I thought this was a great VN that has the potential to be even more interesting and engaging. I wish you luck with your work on this and making it complete! Ah~ Thank you very much for your criticism and comment! I'll keep these things in mind moving forward, especially the dialogue between the main character and the employee. Sorry if it made you feel uncomfortable! His little tours and reflection to each interactions with his sorrounding are enjoyable and also giving kind of calming atmosphere for me.